BLOOD BOWL, BLOOD BOWL, BLOOD BOWL!!! I recently found out about a Blood Bowl tournament that would be happening in my local gaming store... and then remembered that I had left all of my teams back in the UK. Oh well that simply means getting some more! And here they are! 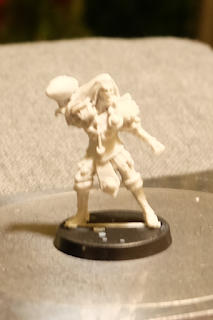 My shiny new Wood Elf Blood Bowl Team: The Modryn Wanderers!!! Of course they are looking a little bland... but that is already starting to change! 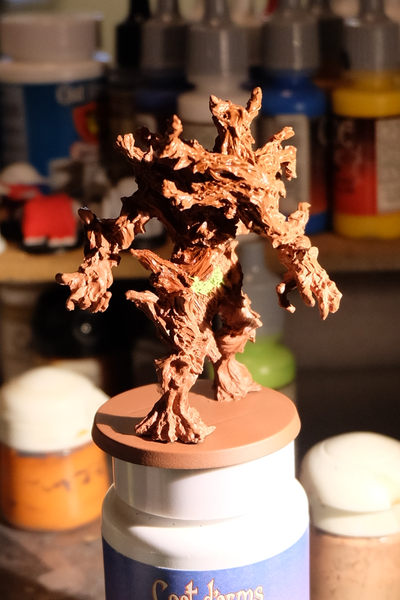 I have primed them with The Army Painter - Greenskin spray that I have been using on my Samurai and Army Painter Fur Brown for the Treeman. 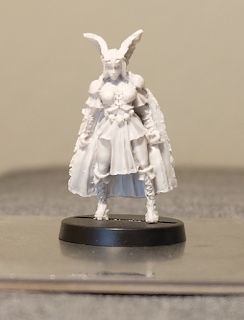 I mentioned in my last blog post how much I liked the primer as it gave great coverage and a really fine misting spray however for these resin figures it doesn't seem to be adhering very well. I had carefully washed off the figures prior to priming to get any mould release removed and yet the primer seems to come off far too easily. 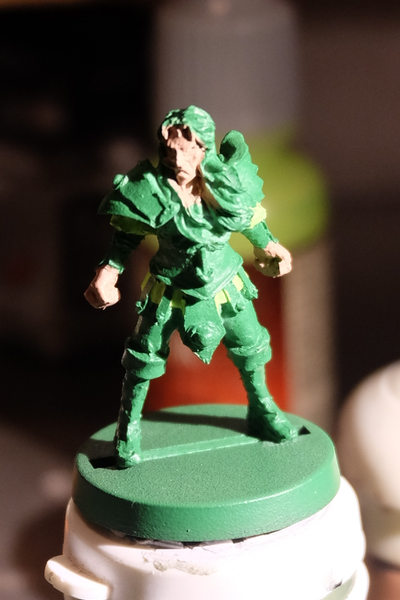 Even worse, I am having difficulty getting my paints to adhere to the primer. 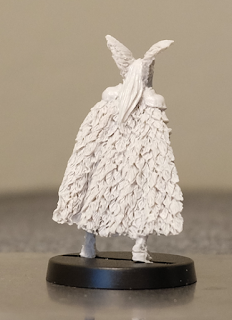 I am not sure if this is because of something I have done but I suspect it may be that the primer is really designed for use on plastic figures and these are just not right for it. I am going to persevere and see what happens and then go overboard with the final varnish but I may regret that decision. 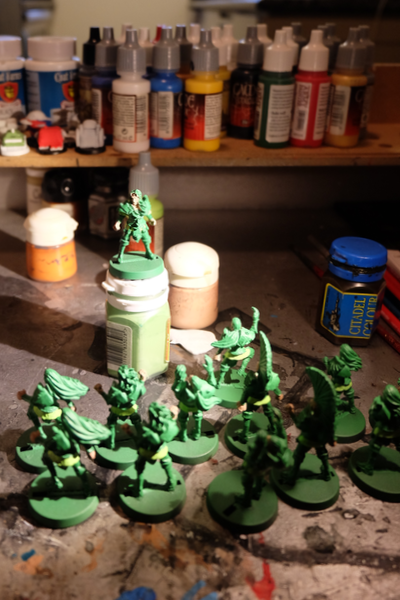 I am curious to see how the painting goes for the samurai, but that is going to have to wait as there is not the same deadline as for the Wood Elves. 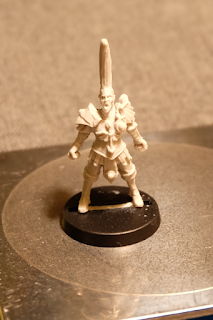 As for the sculpts themselves, I am not quite sure what to make of them. They are made of a pretty light, hard resin that has a little flex and I have already had to repair a couple of breaks due to brittleness. It seems clear from a few of the models that the moulds are a bit worn although this tends to happen pretty quickly with the soft moulds used for resin casting. The sour look on the faces of the Elves is also a bit off putting, though it may mellow out in painting. 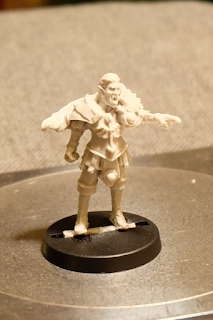 The last complaint is that the flat / curved surfaces are really not smoothed as I would have expected for resin sculpts. 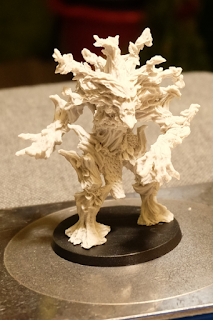 One of the things I had noticed in the past was how well resin can do this type of surface compared to metal casting but it seems that the original sculpts may have been a little lacking in this regard. As such it has taken me a little work to get them cleaned up and I am still not completely happy with the finished result. Hopefully the painting will mask some of this. These lovely ladies are not so high on my priority list as they won't be taking to the field in the tournament but I already have a uniform in mind based on the Pittsburg Steelers - the favoured team of a friend. Sadly the Steelers do not have a cheerleader team and so I will have to try and modify the football uniform for these Amazonians.